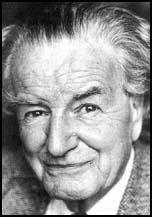 Christopher Hill, the renowned expert on seventeenth-century English history, who died on February 24 at the age of 91, lived through the great upheavals of the twentieth century. Its wars and revolutions moulded the mind of a historian who looked back from one revolutionary century to another, giving him a unique insight into his subject and his books a lasting value that few historians can claim. Hill influenced the way in which an entire generation of students and general readers saw the English Civil War, and even when in more recent years with the fall of the Soviet Union his view that the events of the 1640s constituted a revolution has been widely rejected, academics still define their position on the period in opposition to his analysis. Within a week of his death, however, it was not just the value of his academic work that was being discussed in the press but his own political activity as a member of the Communist Party, when it was alleged that Hill had been a Soviet agent. He was already expressing left-wing views as a schoolboy, although it has never been clear when precisely he joined the Communist Party. This was one of the areas of his life about which Hill was always reticent. At Oxford, he came under the influence of Humphrey Sumner, an expert on Russian history who arranged for him to go to Russia for an extended stay in 1935. He came back fluent in Russian but never spoke about what he had done while he was there, pleading that he had been ill most of the time. In 1936, he became a lecturer at University College Cardiff, but in 1938 returned to Balliol where he remained until he retired as master of the college in 1978. His 40 years at Balliol were only briefly interrupted by his wartime service, during which he was seconded as an intelligence officer to the Foreign Office. There is something more than a little artificial about this indignation. It would have been rather more surprising to find that Hill was not a member of the Communist Party by 1940 since so many young intellectuals of his generation were either members or sympathisers. Nor can it be assumed that such an orientation inevitably implied support for revolution. It was entirely possible in this period to be both a patriotic subject of his Britannic Majesty and a “friend” of the Soviet Union, as for example the Fabians Sidney and Beatrice Webb were. As Trotsky pointed out in his Revolution Betrayed, in the case of people like the Webbs, “Friendship for the Soviet bureaucracy is not friendship for proletarian revolution but on the contrary insurance against it” ( The Revolution Betrayed, Labor Publications, Detroit, 1991, p. 258). There was a significant section of the British ruling class who saw in the Soviet Union their best hope of preserving Britain’s position in the world and preventing revolution at home. Hill’s selection for an extended stay in the Soviet Union and his secondment to the Foreign Office suggests that at an early stage in his career he was being groomed by a section of the ruling class who looked on the Soviet Union under bureaucratic control as just such an insurance against revolution. Ever since the end of World War I, Britain had faced a thoroughgoing political, social, economic and intellectual crisis as the position it had held since the mid-eighteenth century as the leading world power was eclipsed by the rise of the United States. For a time, it even seemed possible that the next major world conflict would be between Britain and the US, until the older power learned to accept its newly subordinate position. At the same time class relations that had been based on Britain’s position of world dominance, which had allowed the creation of a large labour aristocracy and trade union bureaucracy who worked with the Liberals to maintain social peace, were seriously destabilised by Britain’s relative decline. With its rapid industrialisation, the Soviet Union seemed to offer a model of how Britain’s declining industries might be revived and its increasing weight internationally offered a potential counterbalance to the growing power of the US in world affairs. But most of all the example of the Stalinist bureaucracy impressed reformists like the Webbs as the means by which the working class could be brought under control. If Hill had remained a civil servant or died in the war before he wrote his books, it is doubtful whether anyone would have been very interested in his political activities. He would have been one among many and would certainly not have rated any media interest. Guy Fawkes would still be the most famous old boy of St. Peter’s school. What makes his wartime political activities significant is the question of how it affects his reputation as a historian of seventeenth-century England and that question was there to be asked long before the recent revelations. What any serious reader interested in history or politics wants to know is, when we read Hill’s books are we reading the work of an apologist for the Stalinist bureaucracy or of someone who was genuinely struggling to make a Marxist analysis of an aspect of English history? It has to be said that this is a complex question. Not everyone who was attracted to the bureaucratically degenerated Communist Party could be classified with the Webbs. The most gifted and outstanding representatives of the British intellectual elite, whether poets, novelists, scientists, musicians or historians, associated themselves with the Communist Party because the old institutions of church and state had lost their hold over the imaginations of the young while the Soviet Union seemed to embody all that was new, modern and progressive. The Communist Party attracted minds of the very highest intellectual calibre, as can be seen from the fact that many of the developments that were made in biochemistry during the post-war period were prepared by the group around J.D. Bernal, J.B.S. Haldane and other biologists who were prominent supporters of the Communist Party at Cambridge. For minds of this order of brilliance, the Communist Party became a pole of attraction since despite its degeneration under Stalin it still retained vestiges of the immensely powerful intellectual heritage of Marx and Engels. They could not pursue their intellectual work in isolation from the influence of the Stalinist bureaucracy, however. Despite the fact that the Cambridge biologists were all leading geneticists they accepted the fraudulent work of Lysenko because Lysenko had Stalin’s support. The influence of Stalinism on the historians was if anything even greater. The Cambridge biologists never adopted Lysenko’s theories in their own work, but historians associated with the Communist Party developed an approach to history that was directly influenced by the politics of the bureaucracy. The Communist Party sponsored a form of “People’s History”, which is typified by A.L. Morton’s People’s History of England in which the class character of earlier rebels, revolutionaries and popular leaders was obscured by regarding them all as representatives of a national revolutionary tradition. This historical approach reflected the nationalism of the bureaucracy, their hostility to internationalism and their attempts to form an unprincipled alliance with the supposedly democratic capitalists against the fascist Axis countries. People’s history was an attempt to give some historical foundation to the policies of Popular Front—the subordination of the working class to supposedly progressive sections of the bourgeoisie and the limiting of political action to the defence of bourgeois democracy—which provided a democratic facade to the systematic murder of thousands of genuine revolutionaries, including Trotsky. It was the approach that Christopher Hill was trained in, along with E.P. Thompson, Rodney Hilton and Eric Hobsbawm, who were part of the Marxist Historians Group and came under the influence of Maurice Dobb and Dona Torr. There is something Jesuitical about the relationship of these historians to Marxism. They seem to have been capable of partitioning their minds and pursuing a scientific Marxist approach to history up to the point where the Stalinist bureaucracy drew the line, like the Jesuit scientists who would pursue their investigations as far as the Church authorities permitted, but no further. It was an approach that was further encouraged by the extreme specialisation of academic life that enabled them to concentrate on very narrow areas of history that never brought them into direct collision with the bureaucracy on political questions. It is notable that of the Marxist Historians Group Hill wrote on the seventeenth century, Thompson on the eighteenth century, Hobsbawm mostly on the nineteenth century and Hilton on the Middle Ages. But none of them specialised in the twentieth century. In more recent areas of history, as in politics, the control of the Stalinist bureaucracy was too great to allow the free development of Marxist thought and whether deliberately or not they all avoided venturing into the modern arena. It is notable that E.H. Carr, who was never a member of the Communist Party but wrote on the history of the Russian Revolution and expressed a high regard for Trotsky, was for long periods unemployed and unemployable because his views clashed with those on both the left and right of British academic life. As Hill should have known, the British government were well aware of Trotsky’s importance since they would not allow him into the country when he requested asylum. But still Hill’s historical faculties would not let him deny that Trotsky was a great orator, that he organised the insurrection which brought the Bolsheviks to power, and nor does he avoid giving Trotsky more references in the index than Stalin. At no point does Hill repeat the false charges that the Stalinists made against Trotsky and his followers at the Moscow trials. Even in this book, which is certainly hack work, Hill did not make himself fully a Stalinist hack. His criticisms of Trotsky are ill-judged and betray an ignorance of his subject, rather than being malicious and dishonest. He retained a core of intellectual honesty in a work that was written in 1947 as the lines were being drawn for the Cold War, which was designed to defend the Russian Revolution and not to win him friends in high places at home or in the Kremlin. If his book on Lenin represented the low point of Hill’s work, the best was yet to come as he began to publish his remarkable series of books on the English revolution that were to change the way in which the period was understood. His years of greatest productivity came after 1957 when he left the Communist Party following the Soviet invasion of Hungary that suppressed a workers’ uprising. The fact that Hill was not among the most politically advanced elements of the party—those who then joined the Fourth International—is perhaps a greater tribute to them than it is a criticism of him. His subsequent work showed him to be a better historian than he was a political thinker. Hill’s great achievement as a historian was to challenge the accepted consensus of Whig history—that Britain had been peculiarly blessed with a tranquil history based on gradual change and had achieved peaceful progress through class compromise without the excesses of revolution. The most outstanding representative of the Whig tradition is Macaulay and it was continued in the twentieth century by his nephew Trevelyan. It had the advantage that it was at once suited to Liberalism and Labourism. It was a tradition that was physically embodied in the Trevelyan’s country house at Wallington, Northumberland, where Macaulay’s desk is preserved and which was the scene of annual Labour picnics. The roofed central court of this house is decorated with historical scenes and not a revolution among them—as the national epic unfolds from prehistoric times to the triumph of industry and empire in Victorian Britain. They were images that adorned children’s history books well into the twentieth century and underlay much of the popular consciousness of British history. The sense that in Britain things were done differently and without continental excess was not entirely new. Burke had expressed it in his Reflections on the French Revolution, but there were plenty of voices to gainsay him and the social disturbances in the years of economic upheaval that followed the Napoleonic wars were a testimony to the contrary. Luddism, anti-corn law agitation, the anti-poor law movement, strikes and most of all Chartism demonstrated that Britain was not an island of social peace. Nonetheless, the Whig interpretation of history had deep roots in the consciousness of the British political class. The visitor to Chatsworth House in Derbyshire can still see in the great entrance hall a fireplace inscribed with the legend “1688 The year of our liberty.” It refers to the “Glorious Revolution” when James II quit his throne and his kingdom overnight and William of Orange was installed as king. This was the kind of palace revolution that the British ruling class increasingly preferred to look back on rather than the revolution in the 1640s when they had executed the king, conveniently overlooking the fact that James would not have run if he had not remembered the fate of his father—Charles I. The myth of the “Glorious Revolution” was the target of Hill’s first published article, which appeared in the Communist International under the pseudonym E.C. Gore in 1937. It was followed in 1940 by a short essay, The English Revolution 1640, which contained a concise statement of the arguments that Hill was to spend the rest of his life elucidating. Employing the Old Testament phraseology of the seventeenth century he concluded, “The sons of Zeruiah proved too strong for the ideals which had animated the New Model Army.” For the seventeenth century revolutionaries the Sons of Zeruiah represented the forces of reaction that had prevented them achieving their vision of utopia. Perhaps Hill also thought of the Soviet Union as a country in which the Sons of Zeruiah had proved too strong. Hill’s achievements were twofold. Firstly he identified the mid-seventeenth century crisis as a revolution, which in the case of Britain overthrew the rule of one class and brought another to power. Secondly he recognised that revolutions are made by the mass of the population and that for a revolution to take place the consciousness of that mass of people must change, since revolutions are not made by a few people at the top although the character of their leadership is crucial at certain points. These achievements were considerable at the time and are of continuing relevance today, when historians increasingly reject any serious economic or social analysis and argue that revolutions are nothing but the work of a tiny group of conspirators. Hill conveys a sense of the organic character of revolution and views the many ordinary people who made the seventeenth century revolution with admirable humanity. He has been criticised by later historians for only using the published sources and not making any use of the manuscript material that is available. Hill had some excuse for doing so, however, in that the amount of published material from this period when censorship collapsed is so enormous. In the 1640s everyone had something to say about the way the world was going and everyone who was literate wanted to get into print. It is a dramatic contrast with the preceding centuries, when only a small elite with government approval found their way into print. If later historians have made far greater use of unpublished manuscript sources, this to some degree reflects the extent to which Hill made the published sources his own so that they have had to look for new material. What fundamentally separates Hill from his detractors is not that they have turned to new sources, but that they have rejected his conclusion that a bourgeois revolution took place in the mid-seventeenth century. The prevailing academic orthodoxy is that there was no bourgeois revolution because there was no rising bourgeoisie and that people from all social classes can be found on either side of the struggle. Even Cromwell, it is argued, can better be understood as a representative of the declining gentry rather than the rising bourgeois. He and those around him aimed not at revolution, but wished merely to restore what they believed to be the ancient constitution of the kingdom. The whole unpleasant episode could have been avoided if only Charles II had been a little wiser. Hill, of course, was well aware that there were gentlemen and landowners on the Parliamentary side in the civil war and small farmers and artisans on the Royalist side. He had read enough Marx and Lenin to know that one could not expect a chemically pure revolution in which the members of one social class lined up one side of the barricades and those of the other on the opposite side. However, he was sensitive enough to his historical sources to detect the social currents that brought people of diverse social backgrounds into struggle against the king and well grounded enough in history to identify new and revolutionary ideas in the curious and archaic guise in which they appeared—as the ideologists of the revolution ransacked the Bible and half understood historical precedent for some kind of theory to explain what they were doing. Most of all he was sufficiently astute to realise that when the people execute their king after a solemn trial and much deliberation, it is not the result of a misunderstanding but has a profound revolutionary significance entailing a complete break with the feudal past. Although the monarchy was later restored and the triumphant bourgeoisie were soon eager to pretend that the whole thing had been a ghastly mistake, no monarch sat easily on the throne after that event until quite late in Victoria’s reign. More serious Marxist criticisms of Hill are that he always maintains an essentially national approach to the English revolution, which he does not place in an international context, and that he has a tendency to romanticise the religious movements of the period and to be too dismissive of their rational intellectual descendants such as Newton and Locke. In part these characteristics arise from the national orientation of his social class and reflect even in Hill vestiges of the Whig outlook that imagined a peculiarly English political tradition rooted in millennial seventeenth century visionaries like Bunyan that was entirely separate from Enlightenment thought. More significantly it reflects the influence of the popular front politics and national outlook of Stalinism. With Hill this is evident more in what he does not write than in what he does write. Within the strict confines of the few decades that comprise the Civil War and Commonwealth period, Hill had some reason to concentrate on the many religious sects which to modern eyes are so strange that their connection with revolution is by no means obvious. In The Intellectual Origins of the English Revolution (1965), Hill performs a useful task in showing that although there was no Jean-Jacques Rousseau or Karl Marx in the English revolution the revolutionaries of the period were moved by definite social, political and economic ideas—albeit expressed in a religious form. In the period after 1660, all these groups lose their revolutionary impetus, but Hill persists in pursuing them as though they retained their political significance. Like E.P. Thompson he was concerned to demonstrate that there was a distinctive English revolutionary tradition than ran intact from the Civil War to modern times. He had therefore no interest in showing the continental origins of many of the ideas that inspired the English revolution, such as natural rights theory that was to play such a significant role in the development of Enlightenment thought and the political ideas of subsequent centuries. Nor was he interested in examining how the English philosopher, John Locke, or the political theorist, Algernon Sidney, took up the ideas that had been expressed in the course of the English revolution and distilled them into a more precise programmatic form that could be developed in turn by American and French revolutionaries. The science of the period that did so much to inspire a rational approach to politics and society was only of interest to him insofar as he could connect the scientists directly to the revolutionary movement. He never explored the complex relationship between the impetus to social revolution and the scientific revolution, because the increasingly rational and materialistic conclusions of science were uncongenial to him. The materialism of Hobbes and Spinoza was outside his orbit and even Newton, for all his mysticism and millennial visions, left Hill cold. Yet within the 20-year period from 1640 to 1660, Hill’s historical achievements were significant in his own lifetime and are likely to prove more so in the future because current academic history is hardly less complacent than the Whig interpretation of history was in Hill’s day. Simon Schama, who recently presented A History of Britain for the BBC, declares himself to be “a born-again Whig”. His account of the Civil War in volume two of the books that accompany the series is full of colourful incident and fascinating detail, but there is no analysis of the contending class forces involved and the clash of interests that led to the bloody suppression of the Levellers, or to Cromwell’s repeated purges of Parliament and his personal dictatorship. The actions with which Cromwell ensured the success of the revolution are, for Schama, excesses or deviations which violated “precisely the parliamentary independence that the war had been fought to preserve.” This is Whig history indeed, although to be fair to Macaulay it is a neutered variety of the genre. Set against this background Hill’s analysis of the Civil War takes on a very contemporary significance. As an historian he stands head and shoulders above his detractors and his books deserve to be read and reread, and if with a critical eye, it should always be with the knowledge that his limitations and faults as much as his great historical insights and innovations are the product of his time. He may be bettered, but never dismissed, and only bettered by those who have studied him. I would like to make some points in your article in the Guardian 25 July 2009; I like your work especially your book on the Spanish Civil War. Your article in the Guardian is worth reading and should provoke some discussion. I have not read the novel The Mistress of Nothing. Therefore, I cannot comment on the merit of the book. My first point would be to concur the great Irish Poet, writer and socialist Oscar Wilde who said that “Books are well written, or badly written" which was a rant against people not being able to draw a proper distinction between a good and a bad book. For thousands of years writers have been writing Faction, your invocation of William Shakespeare is one case in point. Having done my history degree using some of his works it can be infuriating when you check some of the histories, and it turns out to be entirely different from real historical facts. But to my knowledge, no one has criticized Shakespeare as an evil writer wrong historian maybe. While you will get people that will read poorly written books and take them as historical fact I tend to believe that the majority of people are intelligent and curious enough to check the history for themselves. While it is well within your right to attack the dumbing down and fictionalization of history maybe your beautiful writing may be put to better use especially when history has come under such attack in schools by the current labour government. Lastly, I must take exception to the following extract from your article “It may well stem from an obsessive person who, over the Internet, makes their suspicion sound plausible to tens of thousands, even to millions of others who also have grievances and are eager to believe the worst. Examples include the notion that Aids was created in a CIA laboratory that Princess Diana was murdered by the intelligence services and that 9/11 was orchestrated by the Bush administration. The last point on 9/11 should be clarified while Bush did not pull the trigger so to speak substantial evidence has led to a significant government collaboration in allowing the attack to happen. After all, the FBI had allowed these people into the country and after spying on them for months enabled them to take one-way flying lessons. This I might add is not fantasy but historical fact. By shooting wide of the mark, you sometimes not only miss the target but give the real historical fantasists more credence. Thanks very much for your note. I’m afraid I simply didn't have space to include a discussion of these issues- fascinating as they are - in the Behind Closed Doors book. I made the decision to begin the story in 1939 and so felt it wouldn't be helpful to refer back to this history. I'm sure others would have written the book differently, but for better or worse, that's what I thought was the right way forward. Equally, I'm afraid I can't go into my views on Trotsky here as I would need several thousand words to adequately represent my opinion on that interesting time. I believe my friend Professor Robert Service is writing a big biography of Trotsky at the minute, so it will be absorbing to see his thoughts. Thanks again for your note. Please forgive me the delay in answering your reply. It is probably true that had you taken on board a study of the inner party struggle between Trotsky and Stalin your book and film would have taken on a different tone. Before you mentioned the fact that you have left the matter Trotsky to Robert Service I had somewhat generously given you the right as a historian to choose your subject matter. But as your recent lecture at Coventry Cathedral outlined the deliberate airbrushing things out of history poisons the well that people have to drink out when they try to understand our future from the past. Your choice of Robert Service as a friend tends to confirm Shakespeare's adage by your friends you shall be known. Do you share the same view of Service on the Trotsky- Stalin struggle? I would be grateful to you if you would briefly outline your attitude to Trotsky. I am not asking you to agree with him on his struggle against Stalin, but unlike Mr Service who has a tendency to play down the need for historical truth, I think this crucial for future generations to understand what happened in the former USSR. I am inclined to believe there was a left alternative to Stalin and that an honest understanding of Trotsky’s role in that struggle is crucial. I have added for your information a two-part review by Fred Williams of Robert Service biography of Stalin. 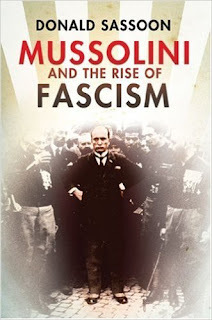 Mussolini and the Rise of Fascism-Donald Sassoon Published January 21st 2008 by HarperCollins UK. “He raised the Italian people from the Bolshevism into which they might have sunk in 1919 to a position in Europe such as Italy had never held before”, Winston Churchill. Whether the author consciously set out to write a book that challenges a very dangerous trend in some poorly written books is open to debate. These books have sought to impose a revisionist historiography that attempts to rehabilitates Benito Mussolini and mystify the rise of Italian fascism. For Sassoon, the study of Italian fascism is not merely an exercise in historical research but has lessons for today’s political situation. To combat the growth of right-wing and fascistic forces in Italy today, the past must be studied objectively and truthfully. Perhaps the most marked development in politics during the Berlusconi years was the attempt to rehabilitate Mussolini and his fascist party. Italy’s former Prime Minister, Silvio Berlusconi, on numerous occasions, praised the fascist “Duce” Benito Mussolini. According to him, Mussolini had “done a great deal of good”. Berlusconi went on to downplay Italy’s collaboration with the Holocaust saying it was “not comparable to that of Germany.” He also repeated the tired lie that Mussolini was pressured by Hitler. One of the more grotesque by-products of the whitewashing of the Italian fascist leader by Berlusconi came about when iPhone issued an app of Mussolini’s speeches. Apple was roundly condemned by a large number of Jewish groups who correctly stated that Mussolini was directly responsible for sending thousands of Jews to the death during the Holocaust. The app was subsequently pulled by Apple. This political whitewashing of Mussolini and the fascists is mirrored in publishing circles by a growing number of poorly written books. At the moment, it is hard to gauge whether this revisionist whitewash is a minority, or has started to gain a foothold in academic circles. So many of these books have appeared that one writer sees it as “a noir publishing niche”. It would take a historian a rather long time to sift through over 100 current biographies of Mussolini to tell whether this very nasty revisionist trend has done any damage in academia. 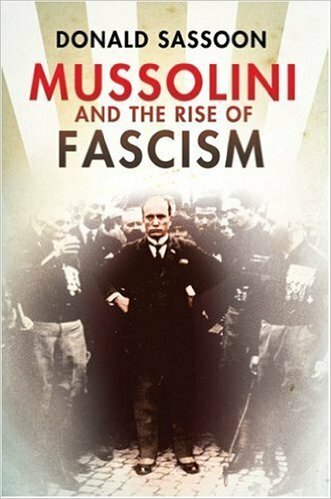 One such book is by Nicholas Farrell  who has sought to overturn decades of historiography to claim that Mussolini was not really all that bad and that he took a wrong direction because of his alliance with Hitler. According to Farrell, Mussolini had "charisma" and was a "phenomenal" personality. Farrell tends to mirror Berlusconi thoughts. It is not that difficult to challenge these falsehoods. A more objective and truthful examination of the facts would also lead us to a different picture. Mussolini’s prime goal was to create a new. “Roman Empire” around the Mediterranean Sea. Another book Liberal Fascism  is “less a work of neutral scholarship or unbiased journalism than thinly veiled historical revisionism.” Jonah Goldberg’s argument is simplistic, to say the least, it is the idea that fascism came from liberalism. A position is not dissimilar to some of the “pseudo-left” writers from the Frankfurt school who put forward the perspective that fascism can be traced back to the Enlightenment. However, it must be said that it was difficult to take this writer seriously when he describes former presidents of the United States as fascists. Given a limited space, Sassoon does a very competent job in explaining the rise of Italian fascism. While not a Marxist he does favor a left-wing slant to his history. The increase of fascism in Italy was a spur-of-the-moment development with significant sections of the population taking part. Its leaders predominantly came from the rank and file fascist organization. Despite taking a plebian character, it was controlled and financed by big business. Its social composition was made up largely of the petty bourgeoisie, lumpen elements of the working class and in its latter stages, it began to draw in larger sections of the working class. Sassoon has done some good research into the social makeup of the fascists in 1921 24-per cent rural workers; 15.5-per cent industrial workers; 14-per cent white-collar workers; 13-per cent students; 11.9-per cent small farmers; and 9- percent shopkeepers. “The proportion of students was, "a much higher proportion than any other group in the population." The notion fostered by far too many right wing history books is that Benito Mussolini came to power in Italy at the end of 1922 by carrying out a heroic march on Rome. The truth revealed by Sassoon is a little less glamorous. Benito Mussolini and his fascists did not crush all before him rather he was invited by the aristocracy and sections of big business to form a coalition government. Once fully in power, the fascists carried out a murderous crackdown against its opponents in the working class. The Italian bourgeoisie had always fancied itself as a high power, but economically this was not the case. The crisis of capitalist rule that brought the Italian fascists into government was the product was Italy's entry, in 1915, into the First World War on the side of Britain and France. The pressure of the war merely escalated Italy’s economic and political crisis. This led to the famous post-war "Red Years" of 1919 to 1920. During these years, a revolutionary overthrow of capitalism was clearly on the cards. Sassoon’s account is very puzzlingly light in these years. Why? To solve this crisis, the Italian bourgeoisie turned to the fascists, as the Russian revolutionary Leon Trotsky explains “At the moment that the "normal" police and military resources of the bourgeois dictatorship, together with their parliamentary screens, no longer suffice to hold society in a state of equilibrium -- the turn of the fascist regime arrives. Through the fascist agency, capitalism sets in motion the masses of the crazed petty bourgeoisie and the bands of declassed and demoralized lumpenproletariat -- all the countless human beings whom finance capital itself has brought to desperation and frenzy”. The second major political weakness of the book is its glaring underestimation of the revolutionary nature of the working class. The Italian bourgeoisie saw very clearly the dangers of socialist revolution and turned to fascism to solve its predicament. In doing it had the collaboration of both social democracy and Stalinism. Despite these weaknesses, I would recommend this book to anyone who is beginning a study of this important international event. I would also urge students and anyone interested in history to fascism to consult Leon Trotsky’s writing on the rise of fascism in Germany and Italy. Moos, Carlo: Late Italian Fascism and the Jews, 2008).